Many of us are familiar with car sharing, popularized by Zipcar, where cars are rented by the hour with a fixed parking space. Regular car sharing members also long for the day where they don’t have to return the car back to original parking space, but leave it wherever they are (as long as they’re in a designated metropolitan area). Well, that time has come, and it provides a model for what the U.S. auto industry could evolve to. October 2008: 50 cars for 500 city employees. February 2009: 100 cars for 1000 related users. March 2009: 200 cars for any resident in the city. Membership is free, and members pay 25 cents/minute, which includes gas and insurance, with a maximum hourly rate of $12.75 and daily rate of $64. No reservations are needed, just swipe your card in the window, enter in your PIN code (see third image) and you’re off. You can still reserve them by the hour if you need to via mobile phone or the web. 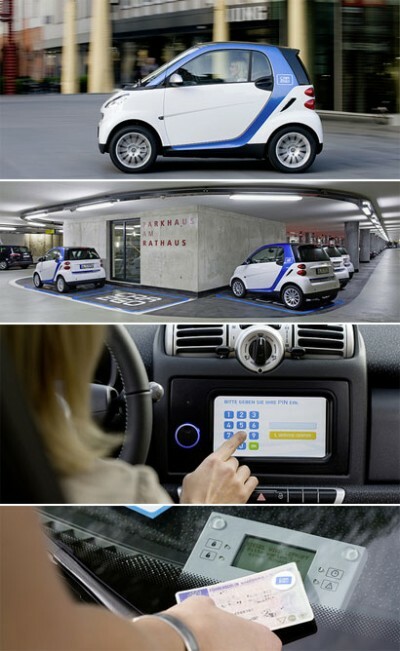 You can track spontaneously available vehicles via GPS on your phone, and even if you come across a car that’s already reserved, swipe your card over the screen in the windshield (bottom image) and it’ll tell you where the nearest one is. Next up? Austin, Texas (pop. 750,000) with 200 cars for city employees. Read more in Wired.